Marshawn Lynch had to like this run. 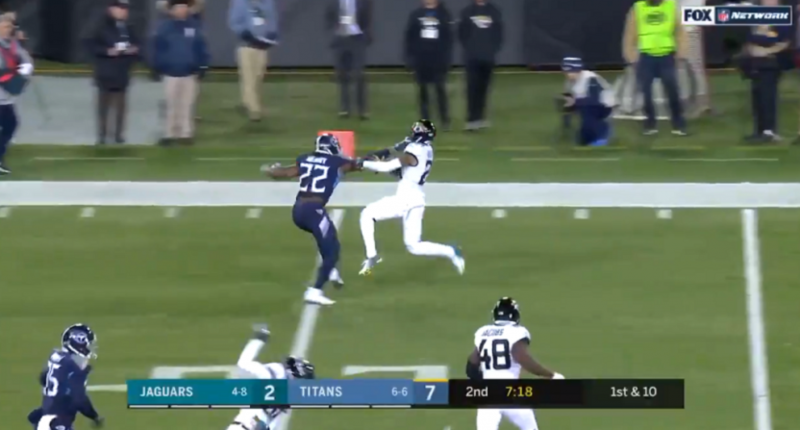 The Jacksonville Jaguars were already not feeling good after getting stopped by the Tennessee Titans on four straight goal line plays on Thursday night. And things got much, much worse for Jacksonville one play later. Tennessee running back Derrick Henry had one of the most ridiculous runs you’ll ever see for a 99-yard touchdown. Henry went full-on Beast Mode with three stiff arms thrown at the Jacksonville defenders on his way to the end zone. Henry has six carries for 129 yards and two touchdowns so far in the game. The Titans (6-6 take a 16-2 lead into halftime in what’s a must-win game for their playoff hopes.